Which is the best way to play MOV files on Android (8.0 "Oreo" or Lower) Devices? We'll see here. Can Android play MOV file? It can't play MOV directly, because MOV is not included in the Android supported video formats list. But Android can open MOV when getting the help from additional programs, like MOV player for Android and MOV to Android converter. Here, we will show you the best program to enable MOV playback on Android, to help you play MOV files on Android tablets and phones, including MOV files recorded from iPhone, iPad, created from iMovie, downloaded online, received from others, etc. How to Play MOV on Android Phones and Tablets? Download WinX HD Video Converter Deluxe to convert any MOV files to all Android devices playable formats. When we have some MOV files for playing on Android, going to Google Play and downloading an Android MOV player seems to be the most direct way the majority could think of. There is no denying that it is a fix, but you need to figure out a few things before any further. 1. Installing an extra player on storage-limited Android device especially Android phone will take up precious memory footprint and may make your device run slower. Do you really need to use a special video player just to play a few MOV files on Android? 2. Most players are not compatible with all video audio codecs. Even if a player is advertised to support for MOV file format, it may be unable to play all MOV files flawlessly. This is also why some people submitted posts online saying "Android player play MOV without sound", "Android player play MOV with sound only, but in a black screen" or other similar questions. 3. Apart from downloading MOV player on Android, a video converter that can convert MOV files and others to Android will be also a good solution? Of course it is. Besides MOV, after all, you are likely to meet other formats incompatible with your Android and your player. Play MOV on Android Using Player or Converter? 1. It will not occupy your Android storage if you download a MOV video converter on your computer and convert MOV to Android. Some powerful converters like WinX HD Video Converter Deluxe can convert MOV videos encoded with any video audio codec to Android accepted formats. Meanwhile, this tool also enables you to convert MOV to all popular Android devices directly, like Samsung Galaxy S8/Note 8, HTC One M8, Kindle Fire, Google New Nexus 7, etc. 2. In addition to help play MOV on Android, converters like WinX HD Video Converter Deluxe can also help play other incompatible videos like AVI, FLV on Android via converting. How to Convert MOV for Playing on Android? Firstly, you should download and install a MOV to Android converter on your computer. 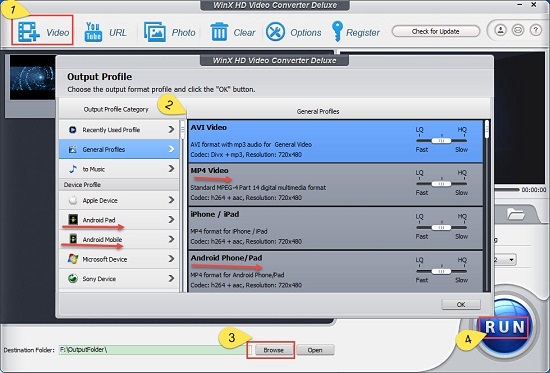 Here, let's take WinX HD Video Converter Deluxe as an example. It is fully compatible with Windows 10, 8.1, 8, 7, etc. And the Mac version can work well on Mac OS X 10.6 and higher including macOS 10.13 High Sierra. And then follow the steps below to convert SD/HD MOV for watching on Android. Step 1. Run the converter and load MOV file(s). Click "+ Video" button on the top left corner to load one or more QuickTime (.mov) videos you want to convert for playback on Android. Step 2. Choose an output playable on Android. After MOV file(s) loading, it will deliver "Output Profile" panel for you automatically. You can choose an output like "MP4 Video" or "Android Phone/Pad" from "General Profiles" category, or select one from "Android Pad" or "Android Mobile" under "Device Profile" category. Step 3. 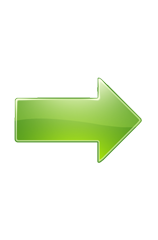 Specify destination folder to store the converted file(s). 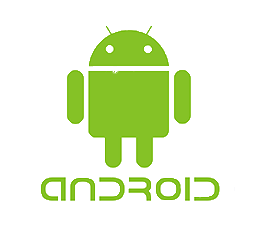 If you have connected your Android device with your computer, you can specify a folder of the Android. If not, you can choose a folder of the hard drive, and transfer the converted file(s) to Android later. Step 4. Begin converting MOV to Android playable format. Simply tap "RUN" button at the bottom right corner to get MOV conversion to Android started. Thanks to the support for multi-core CPU (up to 8 Cores), the improved configuring for i5 i7 CPU, the optimized AMD 3DNow! and Intel SSE3 SSE2 MMX Instructions, and hardware encoder, it will finish video converting at fast speed. -	Make vivid photo slideshow videos with background music.